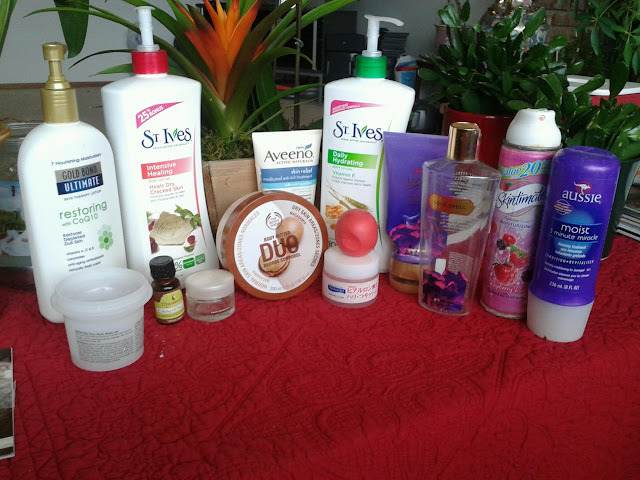 Since I feel like i've finally completely used up a good amount of products, I decided to do this Empties post and give my thoughts about them and if i'd repurchase. 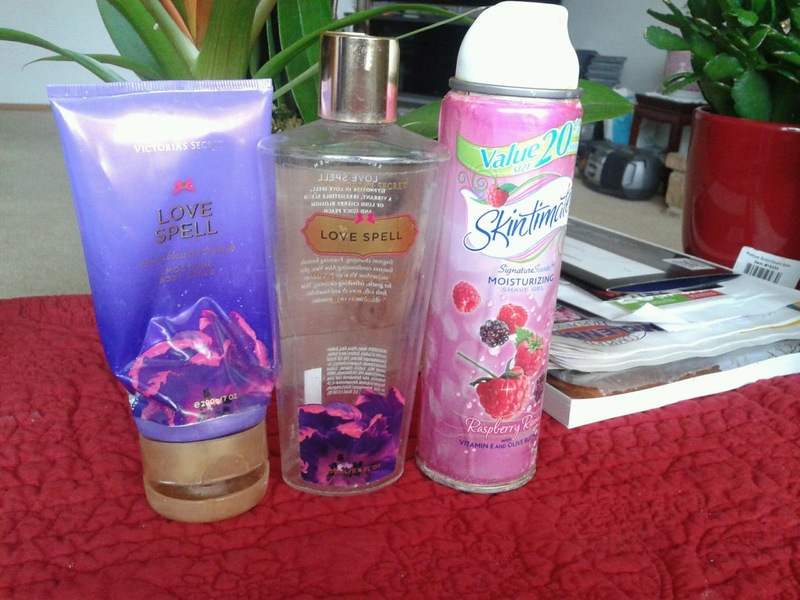 First up are the body lotions. I tend to try a lot body lotions since my skin is so dry and sensitive, I try to look for ones that would suite my skin type and help with my ezcema. Gold Bond Ultimate restoring lotion w/ CoQ10-I've bought this at least 2 or 3 times before and i'd definitely repurchase it. I find that it really helps my ezcema and calms it down while maintaining moisture in my skin. The only down part is that it does have that old man 'gold bond' smell, so I would recommend using this at night. St. I'ves Intensive Healing lotion, heals dry, cracked skin-I really liked this one as well especially for my legs and back area. It had a slight frangrance and wasn't too heavy or thick. I would probably repurchase this one. The Body Shop Duo body butter in Macadamia: This product was alright. There were two types of lotions inside, one thick body butter and one lighter body lotion. I bought it mainly because it was marked a cheaper price at Marshalls. I think I'd much prefer the entire tub to be the thick body butter. Aveeno Skin Relief medicated anti-itch: I bought this mainly to see what it would do for my ezcema. I wasn't to impressed with it and feel like i've tried better for a cheaper price. 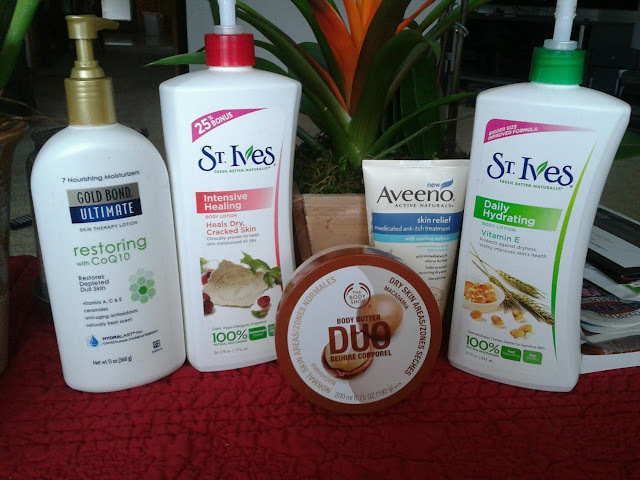 St. Ive's Daily Hydrating Vitamin E body lotion: I did like this one alot as well. I liked using this especailly on my back and neck areas. The smell also wasn't too strong either. Then we have my facial products. Skinfood rice mask-I bought this awhile ago but still found it worked nicely. Skinfood is a Korean skincare line and I purchsed this off of sasa.com. The mask is kind of pricey, but it is expected as it is an imported item. I found that it really calmed my skin down and the rice grains in it helped exfoliate my face as well. L'oreal Eye Defense eye cream: This was the 2nd time I have bought this product and can't really say much about it but that it does it's job well. It keeps the under eye skin hydrated and not overly moisturized which is what I usually look for, and it was at a good price point. Aquamoist Collagen Moisture Cream: Aquamoist is probably one of my favorite Asian/Japanese brand face products. This lotion was really nice in that it kept my skin nice and hydrated and firm as well. I did notice a difference when I used this cream, especially concentrating on my eye area. Definite repurchase. 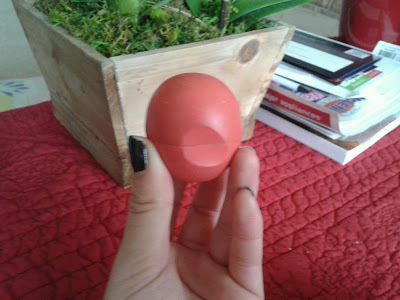 EOS lip balm in Summer Fruit: Can't say much about this product besides the fact that I am addicted to them. This is the 3rd one i've ever used up and Summer Fruit is one of my favorite scents. I have all of the flavors so probably won't need to repurchase this for awhile, and also mainly because I have another one that I am using in this scent. Victoria's Secret body scrub in Love Spell: #1, I love all Love Spell fragrances in any form. It is my favorite scent from Victoria's secret. The body scrub was strongly scented, which I like, but I wish the scrubbing effect would last longer. The grains/crystals that are in it to help exfoliate dissolve rather quickly and sort of ends up as a regular wash. I just wished the exfoliation factor would last longer because it causes me to use more product up. Victoria's Secret body wash: This stuff is good, it lathers nice, and the smell lingers. 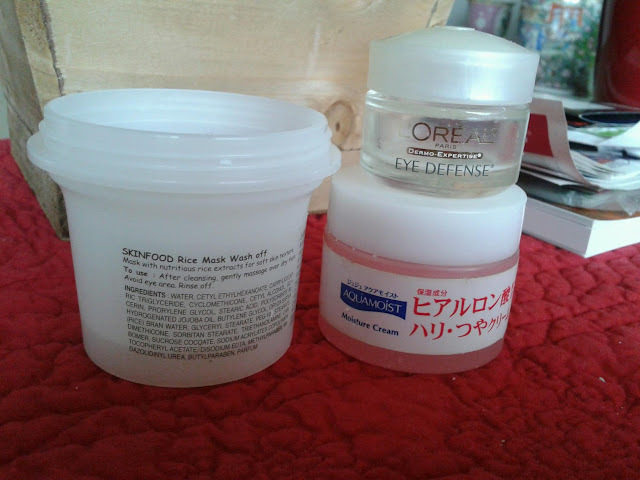 I will repurchase soon. Skintimate moisturizig shaving cream in Raspberry Rain: I'm not too picky with my shaving cream so there isn't much to say about this one. I just remember this one in commercials growing up. It smelled nice and did its job, but i'm in no rush to repurchase this exact one. Macadamia healing oil treatment: I bought this small size and found that when I put it in my hair wet on the ends, my hair would be nice and soft when it dried. I had points at Ulta so I used those to pick up this same size. The bigger sizes are a bit pricey, so i'll still to the smaller ones and use it when my hair really needs it. 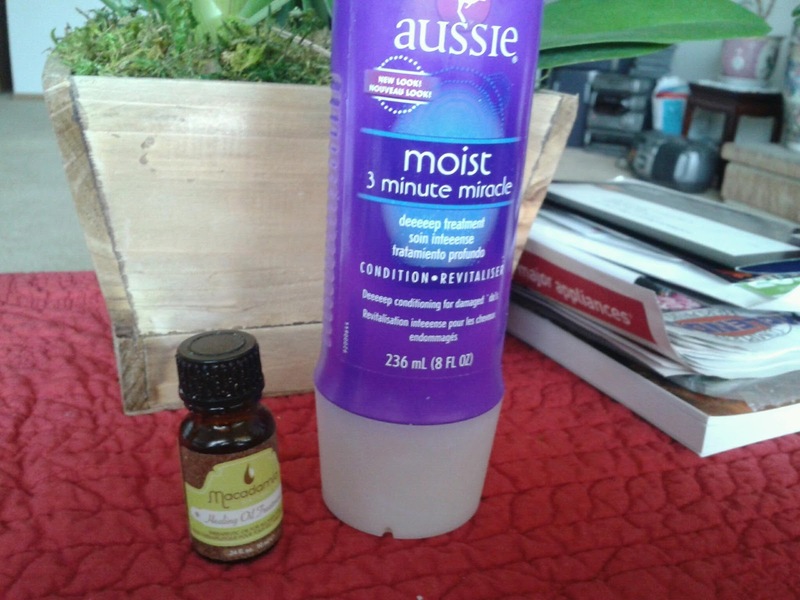 Aussie moist 3 minute miracle: I love this stuff! I've had 3 to 4 bottles of it and will keep buying it. I use it every time I shower on the ends of my hair and find that it really keeps it stronger, softer, and less tangly. The price point is good on this one too. If you can buy it on sale for 2/$5 and find a manufacturers coupon, you can get this for 1.50. Yes..